After the first bite of this White Chili with Chicken and Beans, my husband immediately asked “can this be on the weekly rotation?” Comforting, flavorful, and simple to make. White Chili with Chicken and Beans will become a favorite in your family’s weekly rotation too! Heat a soup pot on medium heat and add the oil. When the oil is shimmering, add the onion, chiles, garlic, 1/4 teaspoon salt and pepper. Cook gently until tender, about 8 minutes, reducing heat to medium low as needed. Add the chicken, broth, cumin, and oregano, turning the heat back up to medium to speed cooking. Using a fork, mash 1 can of beans in a bowl until mostly smooth. Add the mashed beans and whole beans, lime zest, and 1/2 teaspoon salt to the pot. Gently simmer the chili to combine the flavors, about 10 minutes. Garnish each serving with one-quarter diced avocado and serve with lime wedges. This chili can be easily cooked in the slow cooker. 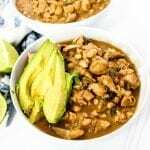 Put all ingredients, except the lime juice and avocado, in a slow cooker and cook on low for 6 hours. Just before serving, add the lime juice and stir. Serve with avocado. You can make a double batch and freeze half or enjoy for up to five days when stored in the fridge. Sub in ground chicken or turkey so you don’t need to spend time cooking the meat.